This month we’re going to be cutting and sewing all those blocks into a quilt top. 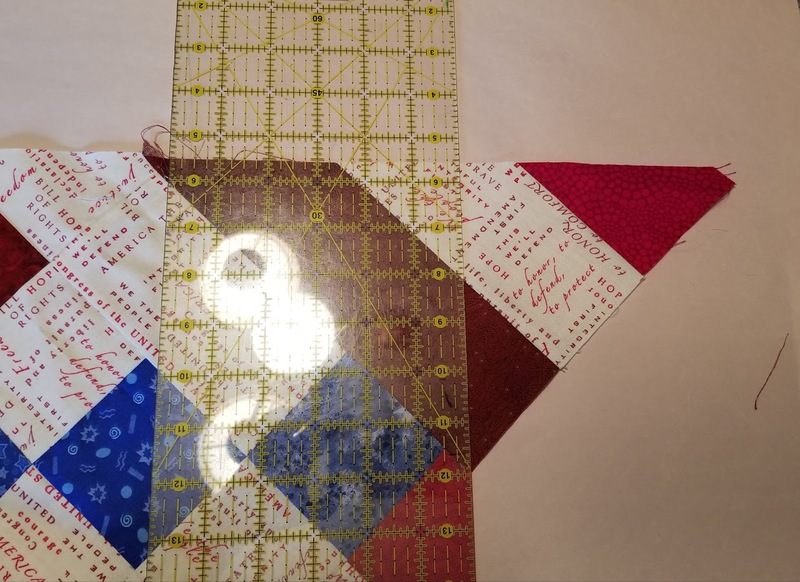 There is 1 set of directions for both tops, Layer Cake Mystery Quilt or Scrappy Quilts of Valor Mystery Quilt. Last time cutting, I promise! We need to cut these blocks before we put the top together. I recommend that you starch and press these blocks first. We will be cutting on the bias and this will help to keep them from stretching. Take all 6 of the E blocks out of the bag. The E blocks have the red or layer cake pieces on the two sides. Cut on the diagonal from mark to mark. 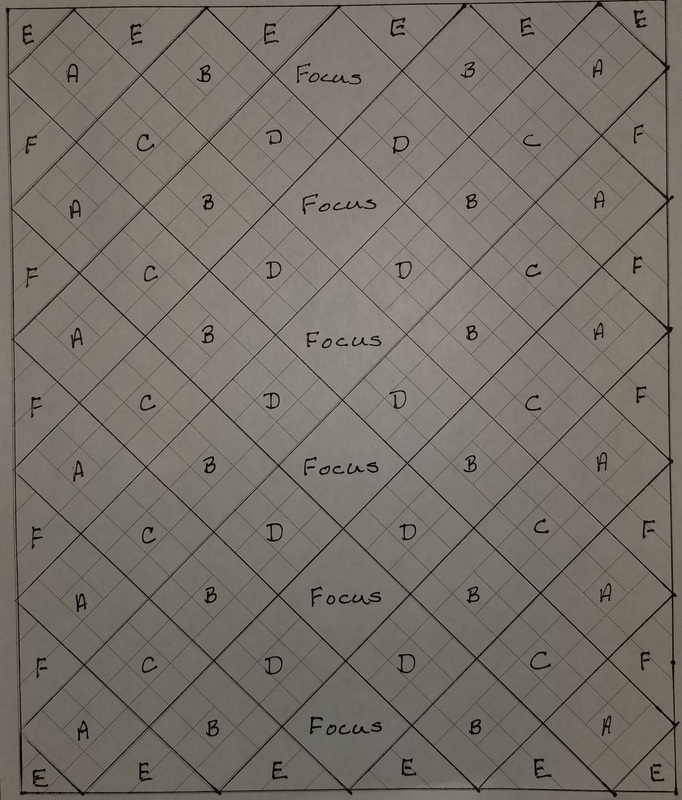 Repeat for the remaining 4 E blocks. Place back in the E/F bag. Take all 6 of the remaining F blocks out of the bag. The F blocks have the red or layer cake strip in the center. Place 2 F blocks right sides together. Repeat the above cutting technique. 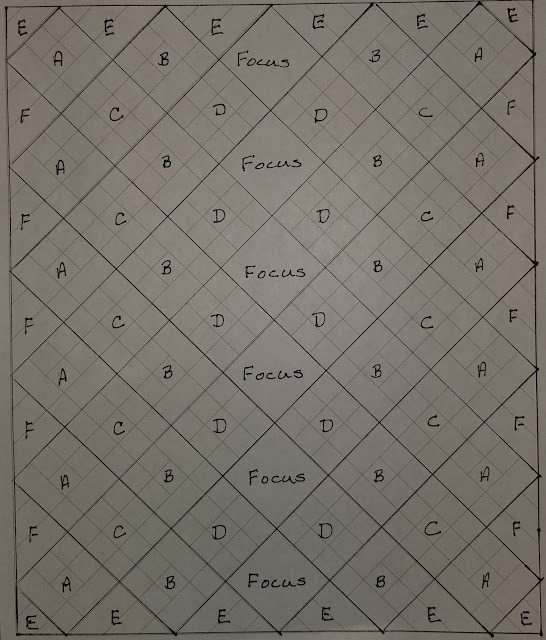 Repeat for the remaining 4 F blocks. Enough with the blocks! Let's put that top together!!! There is 1 set of directions for both tops, Layer Cake Mystery Quilt or Scrappy Quilts of Valor Mystery Quilt. 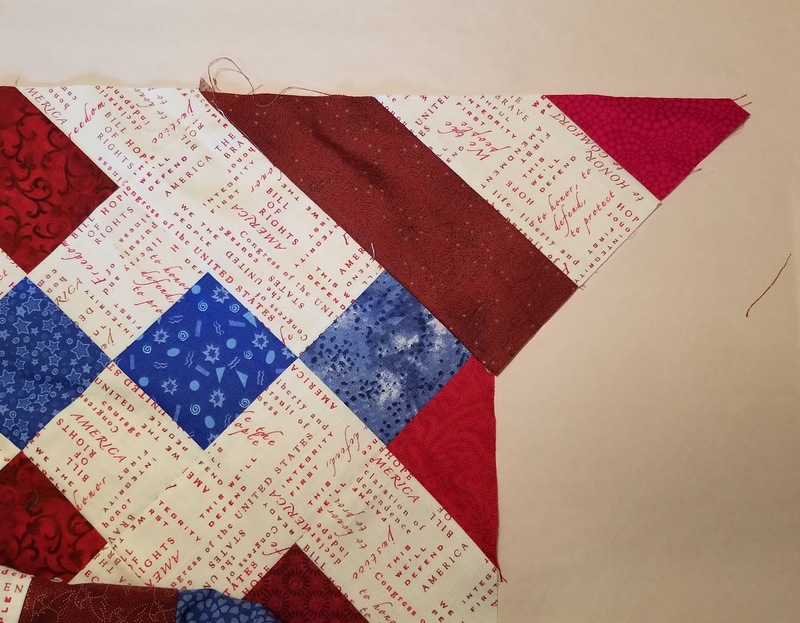 This quilt is on point, so I recommend that you lay out your blocks BEFORE sewing the top together. 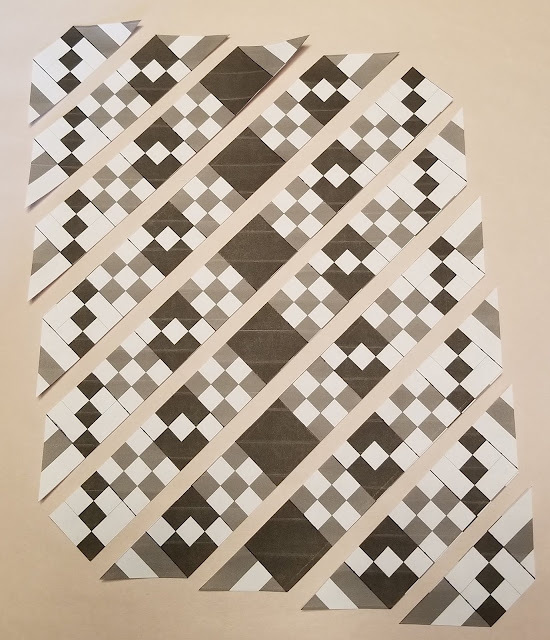 Pay close attention to the orientation of the blocks. This picture does not include borders. I am leaving borders up to you. Because the edges are on the bias, pin your border on and then SEW THE BORDERS ON WITH THE BORDER FABRIC ON THE BOTTOM! This will allow your feed dogs to pull in any extra bias fabric. It will also help to keep you from stretching the bias edges. Now that you have sewn all the rows together, we will add on the final 4 corner squares. Use the remaining E blocks. Sew the blocks on, pay attention to the orientation and then square up the corners. Here is another chart of the quilt layout showing the block letters. Wow! This year has been a wild ride so far! Between all my travels, teaching and quilting, I have met some awesome people! I hope you've enjoyed this Mystery as much as I have. Please send me pictures of your finished quilts. atticthreads@yahoo.com I love seeing all the different fabrics you use.